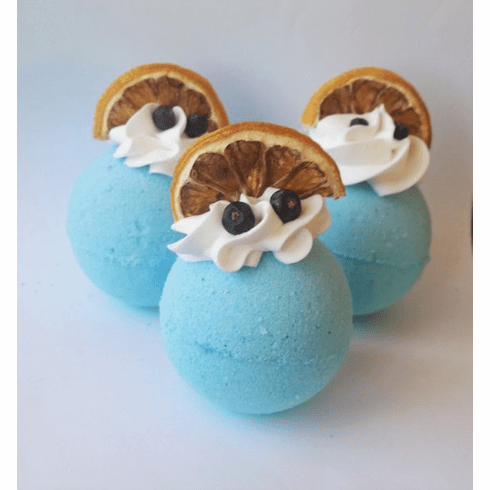 This beautiful bath bomb is decorated with a lemon wedge and juniper berries. Made with tons of goat milk, shea butter, and avocado butter. Weighs approximately 5.2 ounces and is scented in blueberry lemon verbena. Beautifully packaged.
. NOTE: Does not contain soap. You will not see bubbles only fizzing. WARNING: Due to the high butter content in this bath bomb, tub may be slippery after use. Please be careful!Note: These bath bombs contain no SLS (a synthetic detergent) and will not bubble, only fizz.